All over the planet people took up fluffy-soft arms and came at one another to celebrate International Pillow Fight Day. Sacramento took part in the feathery festivities for the first time in the seven year run of Pillow Fight Day. On Saturday in Fremont Park became a scene from a horror movie for birds as men, women and children pummeled each other with pillows. Michael Flanagan put on the event in conjunction with the non-profit community event organization/movement The Urban Playground. With more than 1,300 people RSVP’d on the facebook event, the estimated 150 people in attendance might be considered disappointing. Flanagan said he still considered the day a success. Flanagan spread word about the fight primarily through Facebook and word-of-mouth. Next year he has much bigger plans. After all was said and done and the pillows were thoroughly thrashed it took about an hour to clean up all the feathers and Fremont park returned to a serene peaceful state as if nothing ever happened. 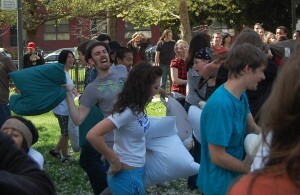 Organizer Micheal Flanagan take a swing at a fellow pillow fighter at Sacramento's first public pillow fight.